Not really. 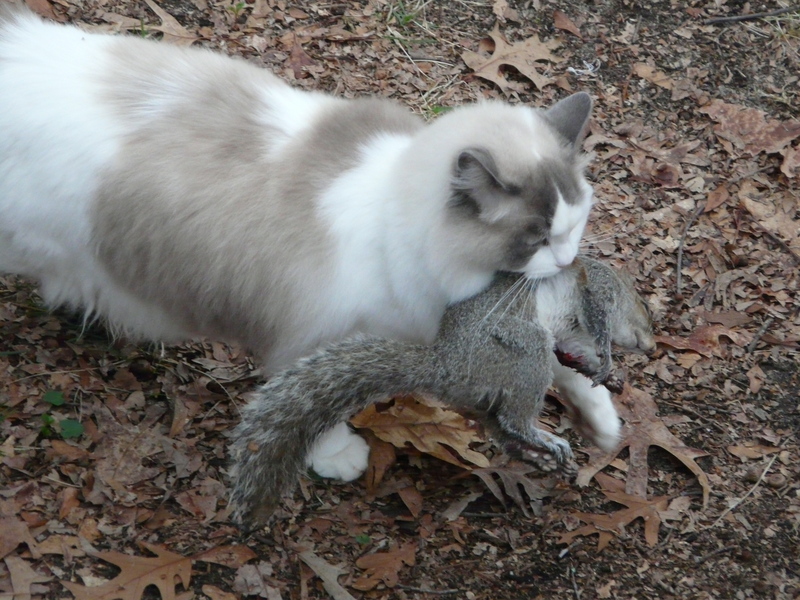 The squirrel was already dead. 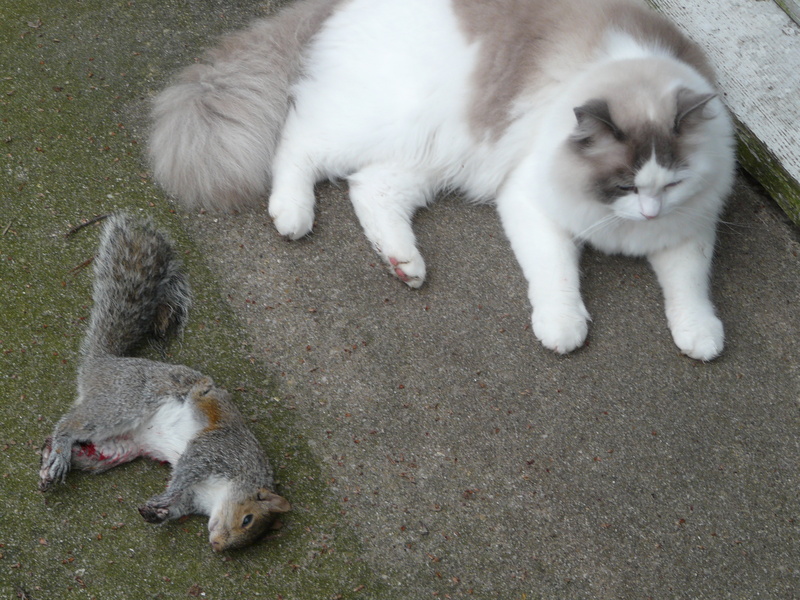 But that did not keep him from feeling very proud of himself and bringing it home to show off his ‘kill’. Why do I have to make this so difficult? It’s only a pair of mittens. But they’re for my daughter. And, she’s—well–great! No one could ask for a better daughter. What did I do to deserve her? So, they have to be special. Getting them ‘just right’ hasn’t been easy, but I think I finally did. The purple is so rich and the two glitzy yarns all needed to stand out. It tastes like puke. I have tried every brand and every flavor. And, it still tastes like puke. I sincerely hope so. These yarns screamed at me to be put together. It took a while for them to decide what suited them best. At first, they said lined mittens and socks. 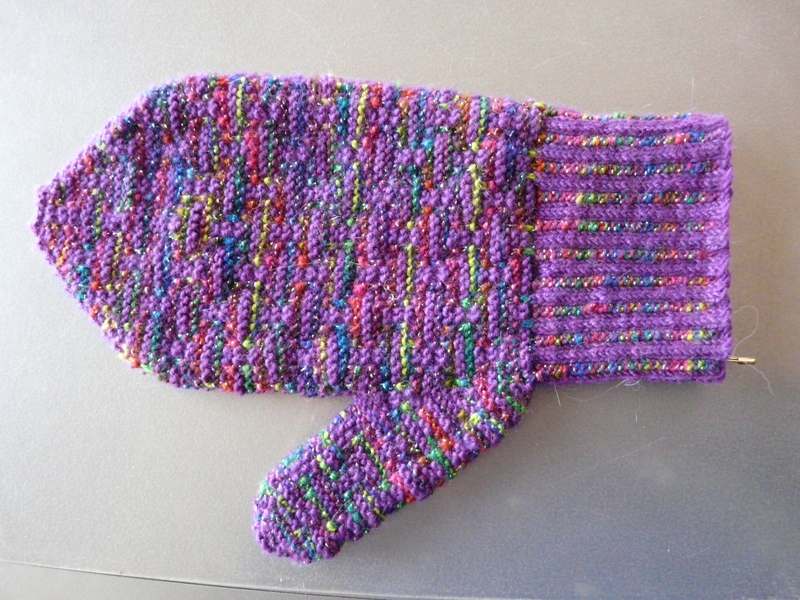 When I was about half way through a mitten, they said, ‘No. That’s not it’. I reminded them that it really doesn’t get that cold around here. I suggested gloves. They laughed. They knew that I love to make gloves. They suggested getting out the fair isle glove book. We really had a good time with that one. There were so many beautiful designs. They started jumping up and down and screamed, ‘This is it! This is it!’ I had my doubts. 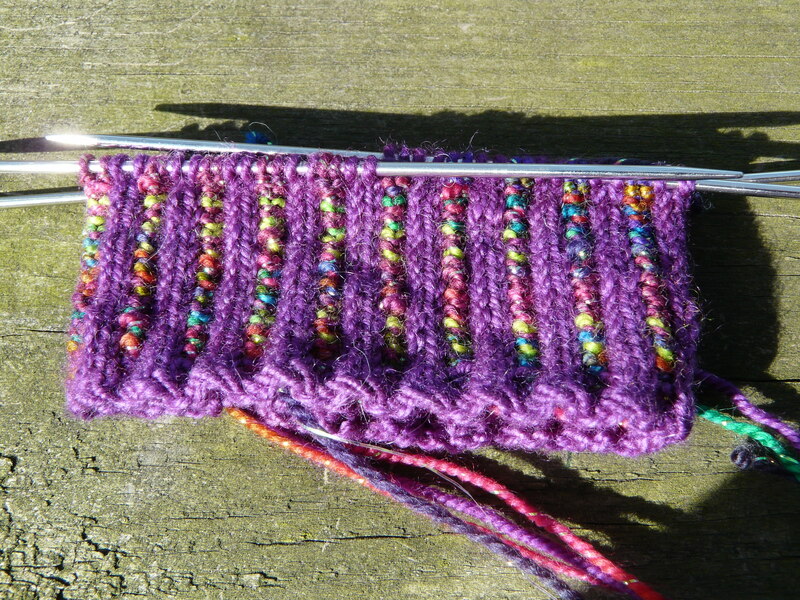 Once I had finished the cuff , they agreed with me. They wanted to know what happened to the pattern. They couldn’t see it. I said, ‘I told you so’, and pulled it all apart. So. I did what I wanted. Who’s laughing now? Silly old yarn. What do they know? 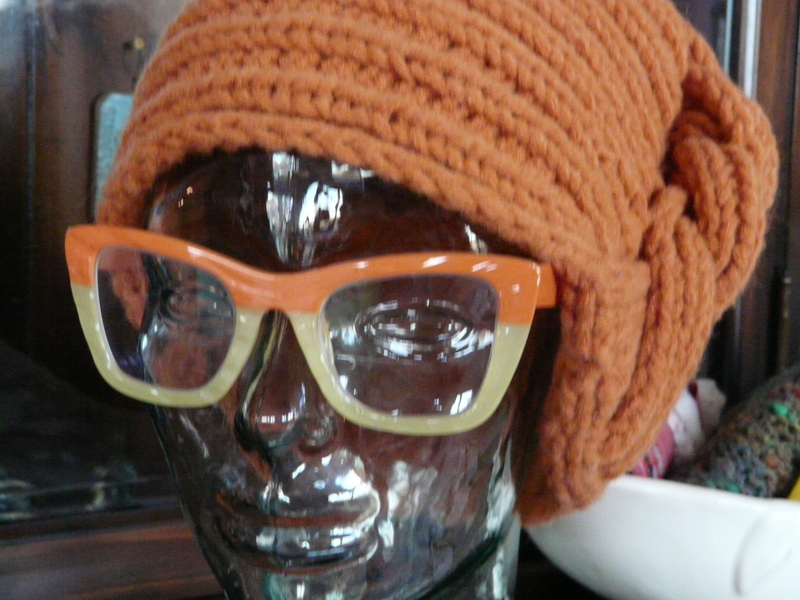 Posted in Knitting | Comments Off on Is The Third Time The Charm? No. Not me. Although, I have mentioned to break my little toes a few times, they still work well. I’d say my hands and feet are the only things that still work well on me. If anything ever happened to my hands and I couldn’t knit or sew, do the humane thing and just take me out and shoot me. Please. It’s my cutting table. I have one of those cheap folding kind with rollers that wear out quickly. I could get one of those fancy expensive ones, but they don’t fold up and move easily. This one I can stick in a corner and I can move it around without any help. I think that we can all agree that I am a bit independent. But that’s why Sweetums loves me. And this is why I love Sweetums. 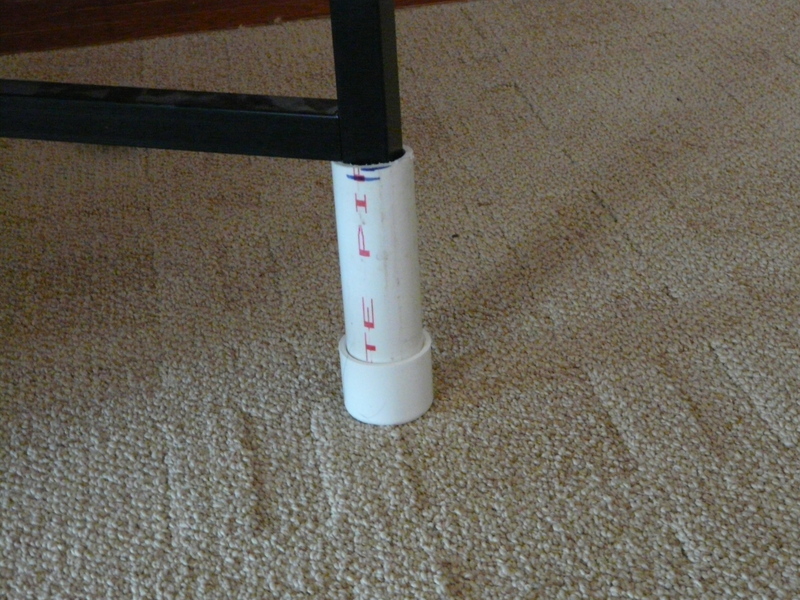 The new leg fits over the old and the caps slide easily over the floor. I’m so happy!